Dreamworks Animation has been on somewhat of a roll recently with the success of both Kung Fu Panda (2008) and last year’s How To Train Your Dragon (2010). Whether that roll continues was down to this inevitable sequel but how have Po and co held up in their second outing? Everyone has something to say about sequels. Sometimes they continue a story, sometimes they’re milking a cash cow and more often than not they’re crap. Especially in the case of animated films where the Toy Story series is the exception that proves the rule. The 2008 original was a great animated feature with heart and a wonderful style, but it didn’t cry out for a sequel, except to those for whom it was making money. It works on its own as an underdog tale and beacon of light to overweight children around the globe. So the sequel should have no right being as good as it is then, right? Wrong. 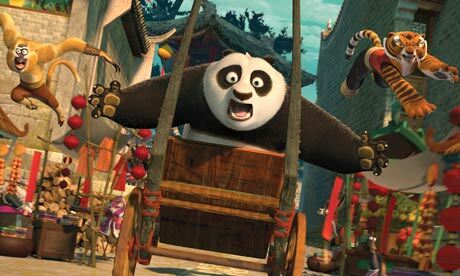 Kung Fu Panda 2 (2011) is a great film, every bit as good as its predecessor and intriguingly it doesn’t play with convention. Animated films aren’t usually action packed but here it’s pretty much non-stop, save only for a few, sometimes remarkable scenes delving into Po’s history and his own personal crisis. Yes, you heard right, there’s character development in this. It may not change who Po is but the character goes through a journey. It’s hardly as complicated as full blown adult dramas but it works perfectly as a way of both breaking up and adding more to the insane action. Credit where it’s due, Jack Black does really well in the lead role. Unfortunately the rest of the cast are underused. The level of action leaves little dialogue for anyone other than Po and villain Shen (Gary Oldman). The scripts for the supporting cast, including Dustin Hoffman, Lucy Liu, Jackie Chan and Seth Rogen couldn’t have been more than a page long. Although Rogen does get arguably the best line of the film. Angelina Jolie as Tigress is the weak link. Her character is on the verge of some kind of change but her acting never really conveys it and it comes across as though she was reading her way to the pay cheque with little care for the film. Perhaps harsh but much like the criticism in the previous paragraph, none of it really matters. This is an exciting film, packing a lot of punch into its 80 minute running time. The fight scenes put a lot of action films to shame, it’s well directed, intricate and very, very exciting. Stylistically the film is every bit a match for the original, mixing cutesy western animated sweetness with ancient Chinese culture. The mix is as charming as ever.